Transport: BMW provided by the hotel. 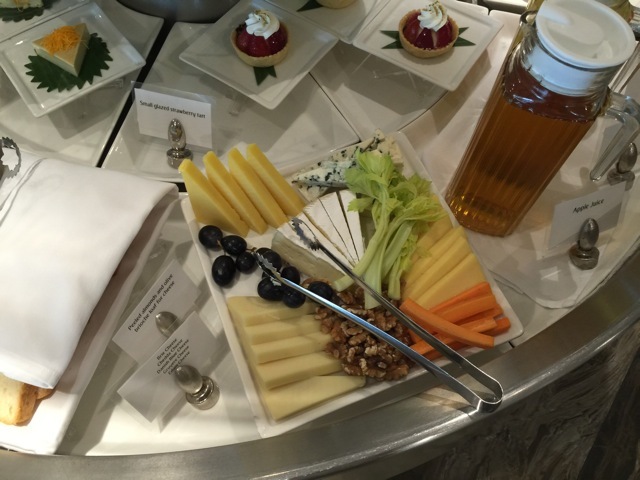 Departs from: Right outside the hotel lobby. Journey time: About 40 minutes, depending on traffic and the extent to which the driver’s sense of self-preservation is developed. In case you are wondering, the Emirates website explicitly states that their limousine service is not available to passengers travelling only between Bangkok and Hong Kong. That is why I had to organise a car from the hotel to take me. Location: Entrance 9 on the departures level, rows T and U. 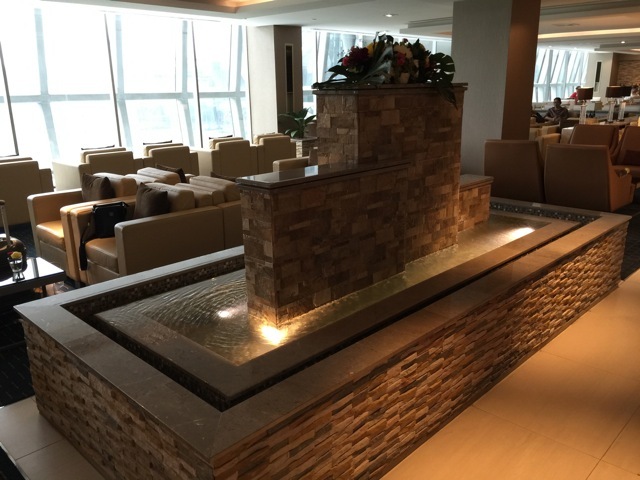 Facilities: One First Class counter, four Business Class counters, nine Economy Class counters. The day before the flight I receive an email from Emirates inviting me to avail myself of their web check-in service. We pull up to the terminal near entrance 9, where the hotel’s airport concierge is already expecting me. He takes my luggage and guides me to the Emirates check-in counters. The check-in agent is very friendly and all smiles. She hands me my boarding pass, together with a voucher for the Premium Lane security check and immigration and sends me on my way. In the meantime, the concierge has been waiting dutifully. He then accompanies me to the entrance for security, wishes me a pleasant and safe journey and bids me goodbye. 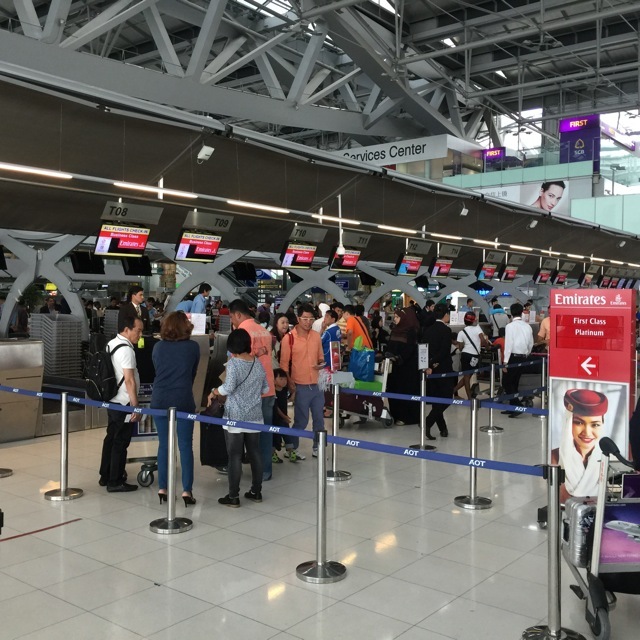 The entrance for the Premium Lane is on the same level as check-in. All other passengers however, need to go one floor up. Location: One floor down from the check-in level. 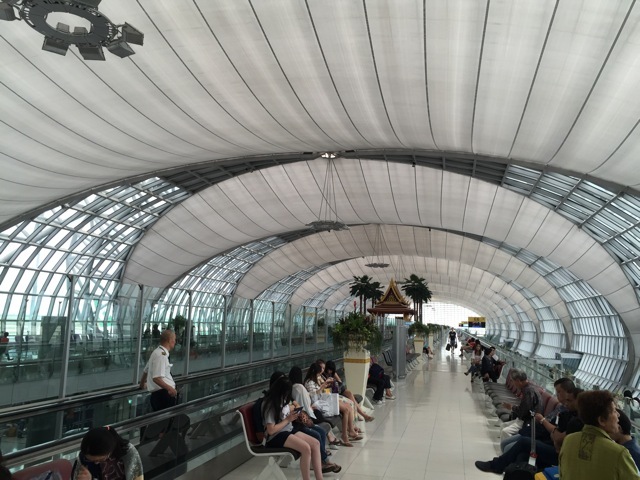 To reach the lounge, turn right after immigration until you reach the intersection of the D and E concourses. Take the escalators one floor down to level 3 and do a 90 degrees left turn at the bottom. Keep on walking until you reach to lounge. 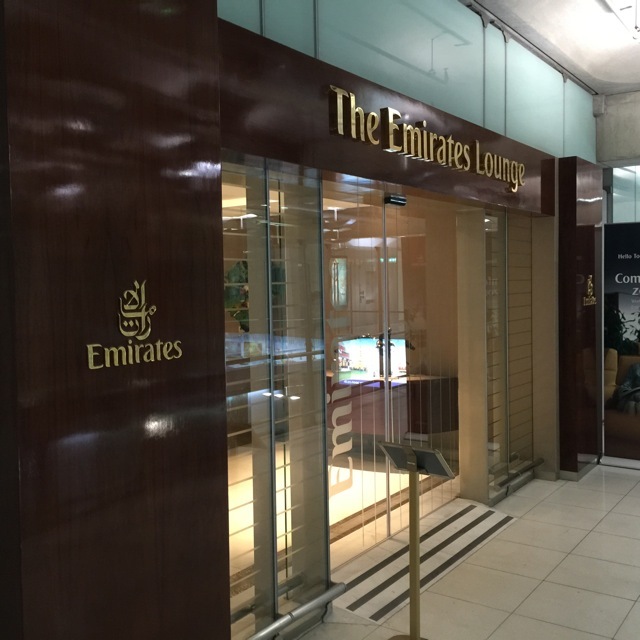 Type of Lounge: Dedicated Emirates only lounge. 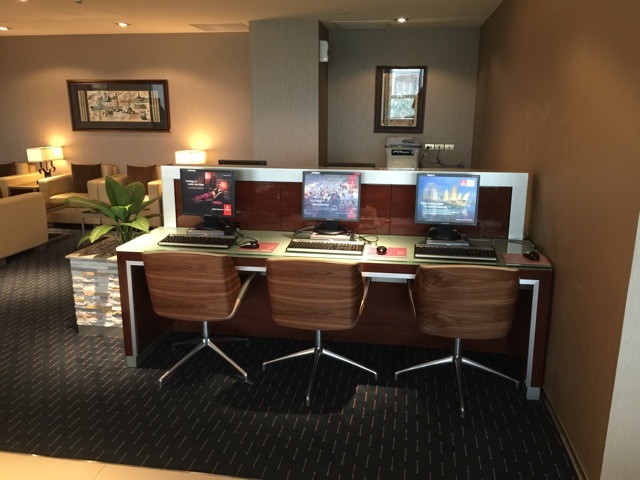 Facilities: Toilets, showers, workstations with printer. Internet: Wifi is available, password required. This is a really nice lounge. There is a lot of wood, with beige and brown leather sofas. 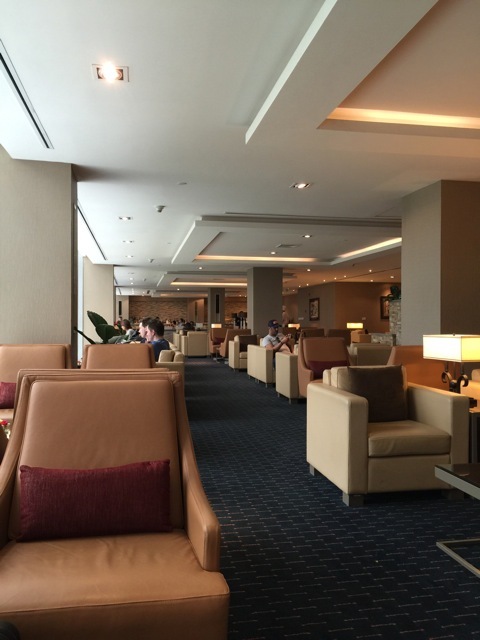 There are two things that really strike me about this place: first of all, there are toilets and even showers in the lounge itself, which is quite unusual in Bangkok. 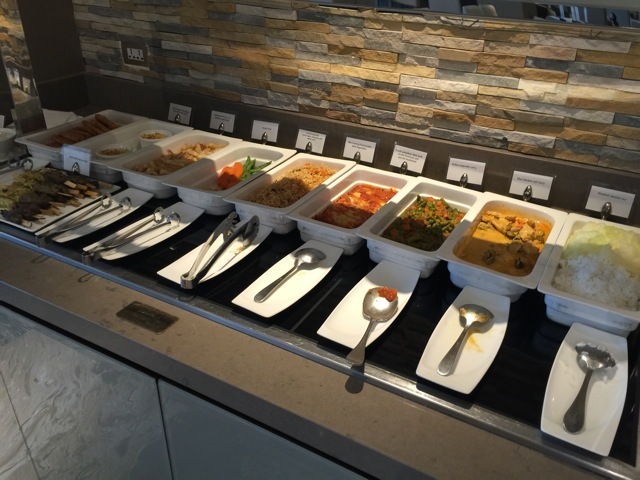 In fact the only other lounges with facilities at Bangkok airport are those of Thai Airways. The second thing is the food. There is so much of it and it is so tasty! There is even a separate dining area with proper dining tables. 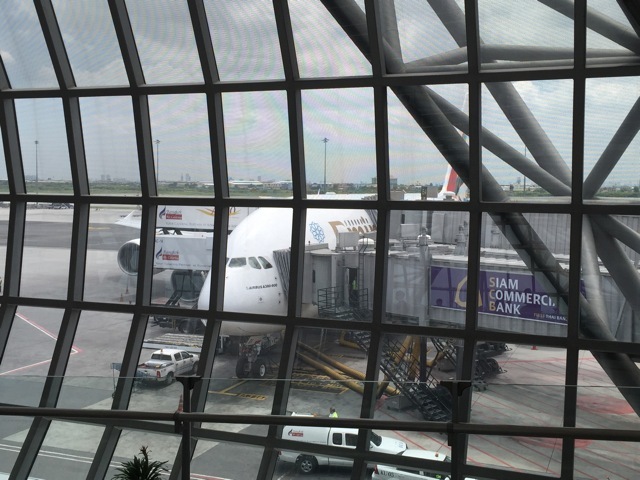 I am quickly coming to the realisation that most airports that receive the A380 are not really equipped to handle the beast. At least not properly. 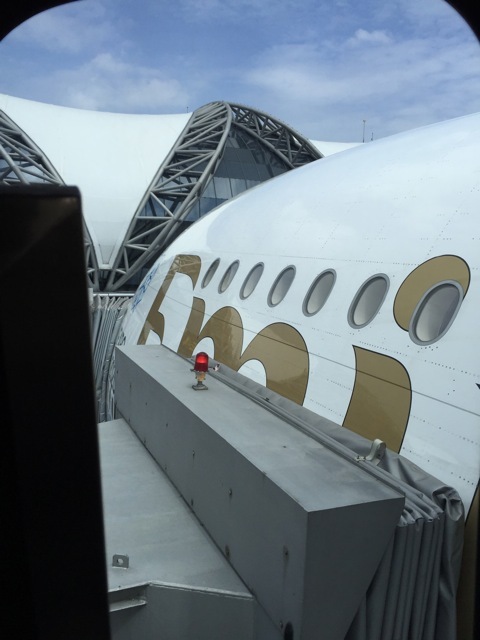 If you think that providing a third airbridge that goes to the upper deck is enough, I think you better think again. Alas, Bangkok is no exception here. Boarding starts and very soon it becomes apparent that there simply is not enough room for all the passengers wishing to board the plane (Just to give you the general idea, I have sequence number 543 on my boarding pass). 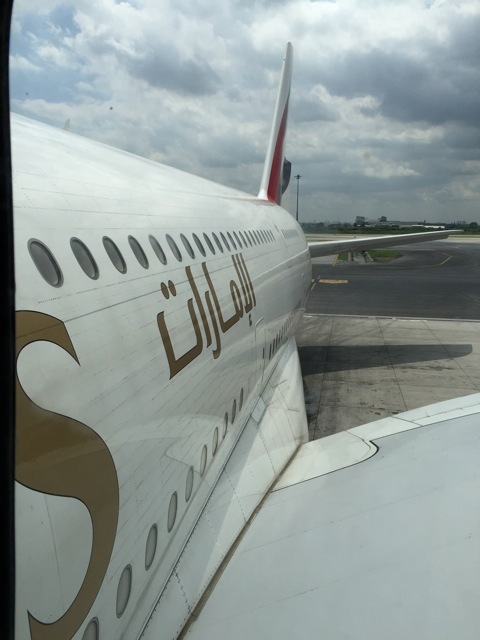 At some point, one of the Emirates ground agents asks the passengers to move to the back of the gate and take a seat while we wait for boarding to begin. Nobody moves. The agent obviously has some serious attitude issue going on, and simply gives us this rather cocky ‘hello’, behaving quite as though we are deranged or mentally challenged for not falling in with his instruction to move to the back and take a seat. I think it never even dawns on him that there is simply no getting through to the back of the gate because it is in fact full. Eventually boarding starts with a delay of thirty minutes. 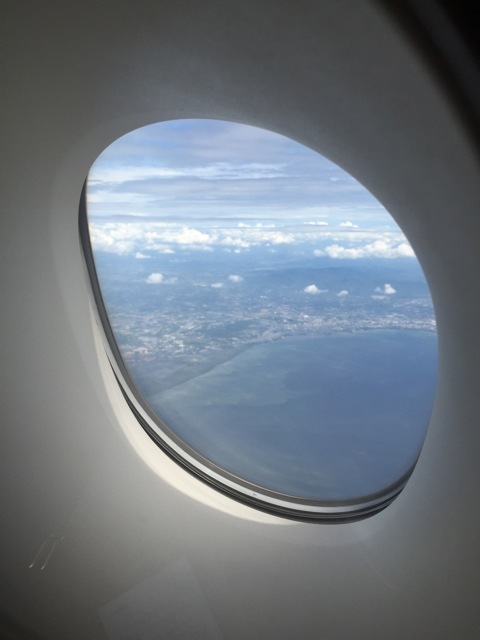 Seat: 1K, window seat on the starboard side of the aircraft. 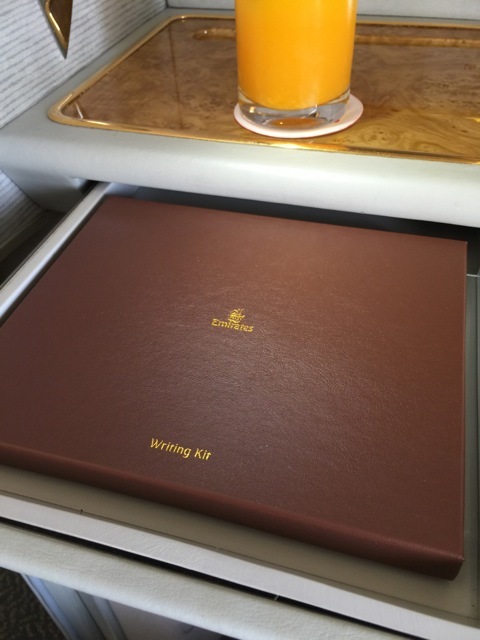 The Emirates First Class suite hardly needs an introduction. When it was first introduced, the airline truly caused a sensation. 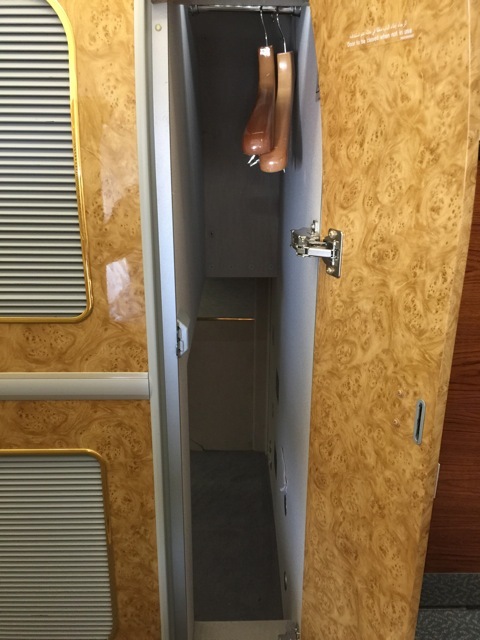 The suite is very private, due to the fact that it has sliding doors to screen passengers for more privacy. The suite is not completely closed though, and if you are standing in the aisle, you can still look into the individual suites from above. 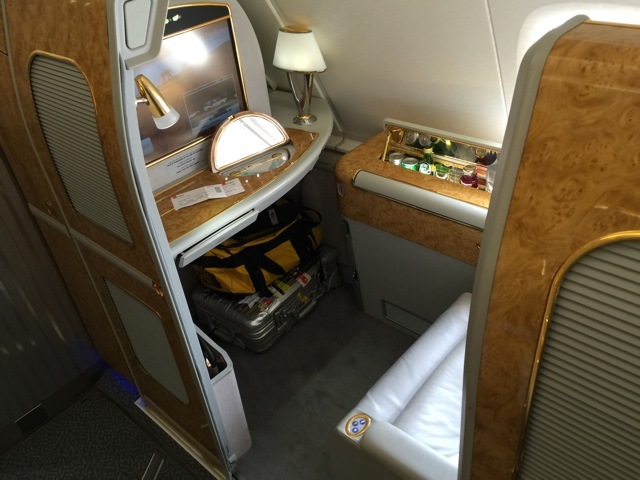 The First Class cabin is located on the upper deck and there are fourteen suites in total. 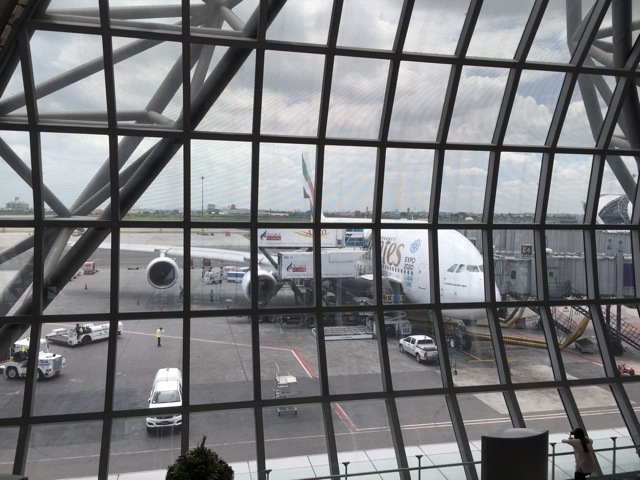 Emirates operates the A380 in two configurations. 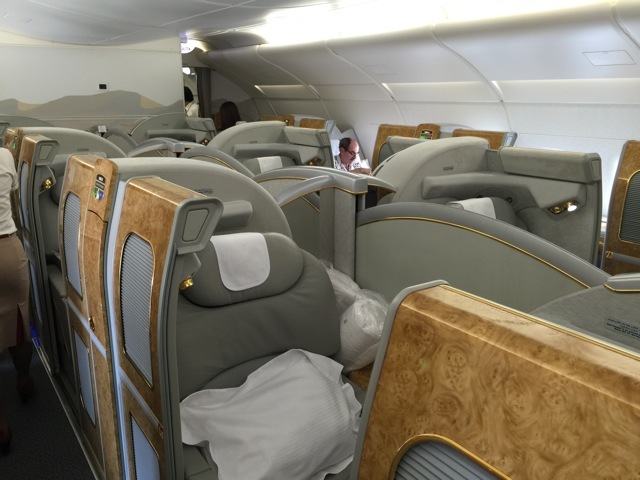 In both cases, First and Business Class are on the upper deck. Economy Class is on the lower deck and the difference between the two configurations is the number of seats in Economy Class. 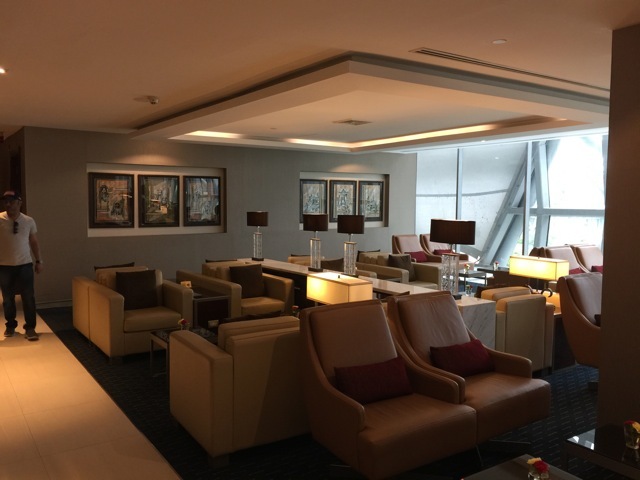 Facilities: 110 volt AC power port, wifi available through OnAir (who also provide the wifi for Qatar Airways), individual bar with a selection of soft drinks. 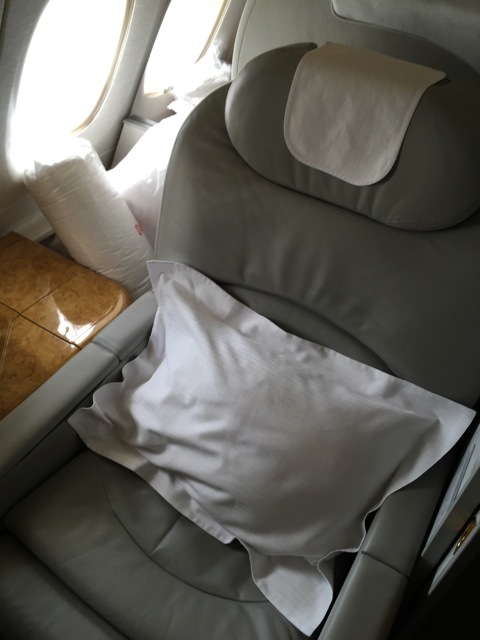 Audio and Video: Each seat is equipped with Emirates’ ICE inflight entertainment system with a huge selection of films, games, music and television programmes. The selection is extensive and has a good mix of classic and fairly recent films. Crap! The seats are covered in faux leather. I really do not like that because the plastic makes me feel sticky and sweaty. But apart from that, I think I shall never be a fan of this seat. In fact, I think it is in really bad taste. There is fake wood and gold coloured plastic everywhere. Furthermore, the design of the seat does not really make much sense either. On the side of the seat/suite there is the cabinet with the drinks. This is also where the remote control is. As a result, there is not really any space to put any drinks here. Either because the remote control is in the way, or because then you cannot open the drinks cabinet. 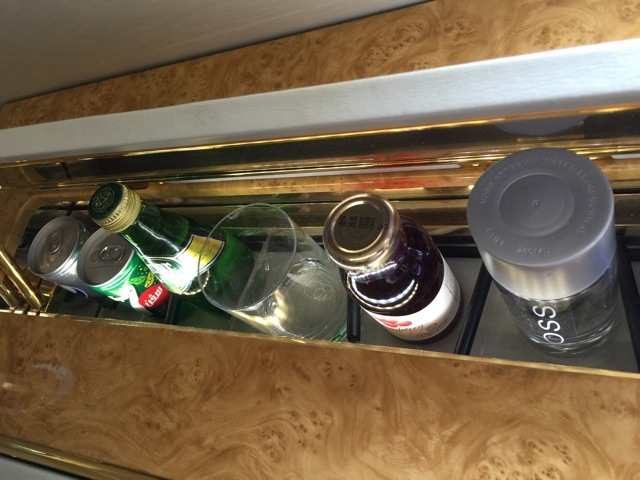 As a result, the crew place things like drinks, nuts or the hot towel on the shelf in front of the screen. Which is okay. The only problem with that though, is that the shelf is too far away to be reached when you are sitting in your seat. There are a few other issues like this. There is a button on the left armrest to move the seat closer to the dining table. The only problem though, is that once the table is open, you can barely reach the buttons because they disappear under the table. Oh yes, and after about thirty minutes the remote control decides to die on me. No more battery. And so I resort to using the touch screen, which again cannot be reached from a sitting position. 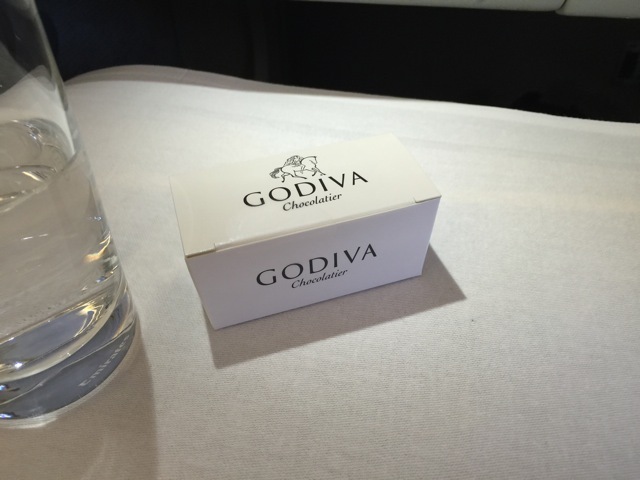 All this is really no big deal, but it is hardly what you would expect from a first class product. There are twenty-three cabin crew on this flight. There is not really much I can say about them. They all seem friendly enough, although there is nothing personable about them and interaction with the passengers is kept to the minimum. Welcome drink on the ground: Coffee and a date filed with walnut. Hot towel before the meal: Scented hot towel served on the ground. 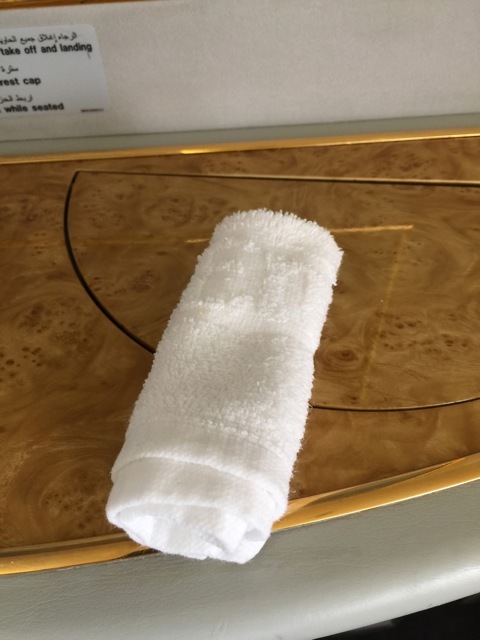 Unlike Qatar Airways, the towel is not handed to you on a dish but placed straight in your hand. 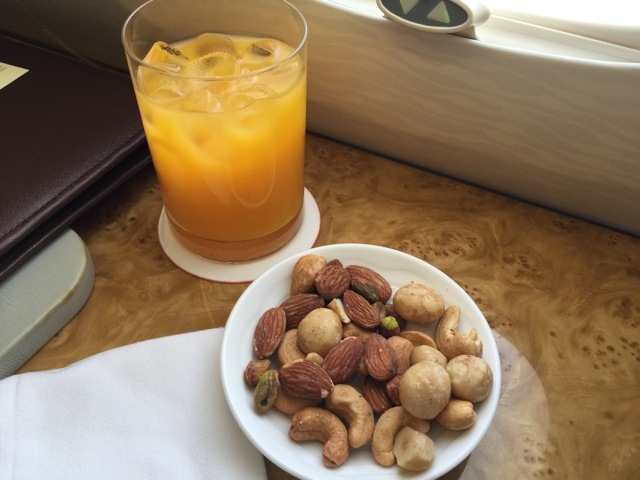 Pre-meal drink: Orange juice with mixed warm nuts. 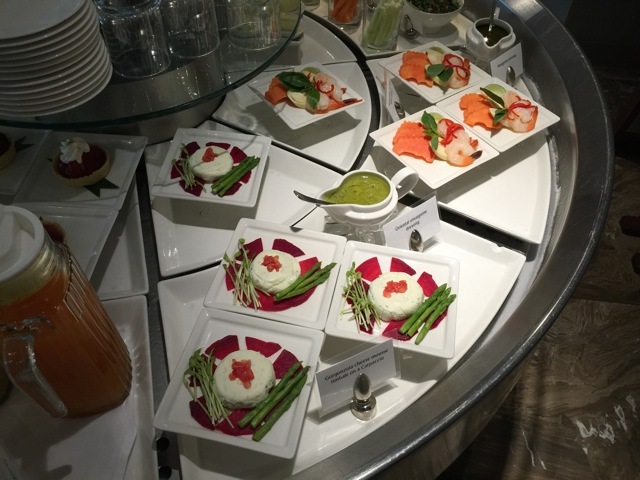 Choice: There are two choices for the starter, four choices for the main course and four choices for dessert, including cheese. 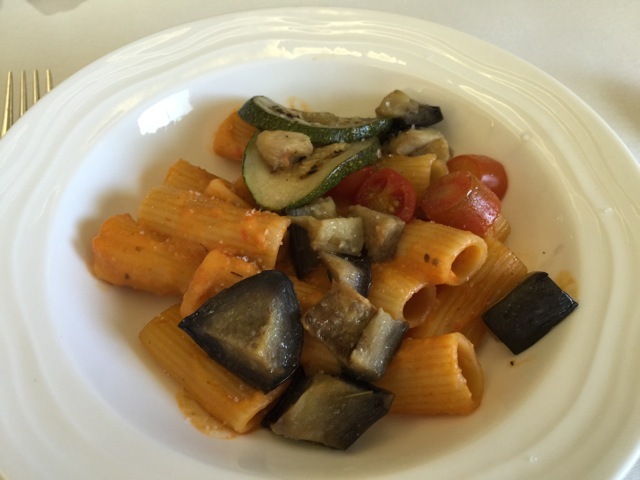 Rigatoni with a creamy tomato sauce, aubergine and courgettes. 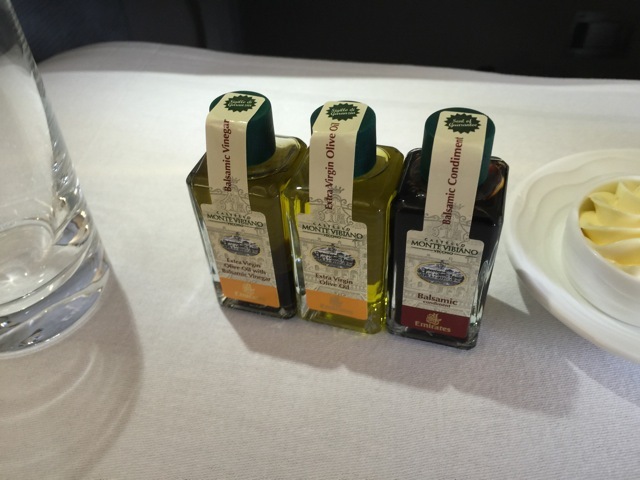 Selection from the breadbasket, served with olive oil and butter. And what an appalling meal it is! I mean seriously? Where shall I start? *Standby for a major rant*. Both appetizers on the menu do not sound or look overly attractive (really dry looking salmon of greasy duck), so I give that one a pass and simply start with the salad. I have just managed to put one macadamia nut in my mouth when the salad appears. We have a flight time of two hours and fifteen minutes and only five passengers in First. Do you think you could maybe slow down a bit guys? 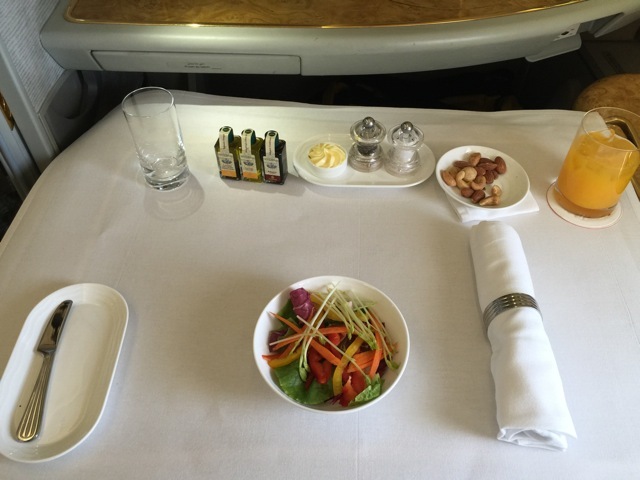 The salad is really puny, like something SWISS would serve in Business Class. And that is not a compliment. 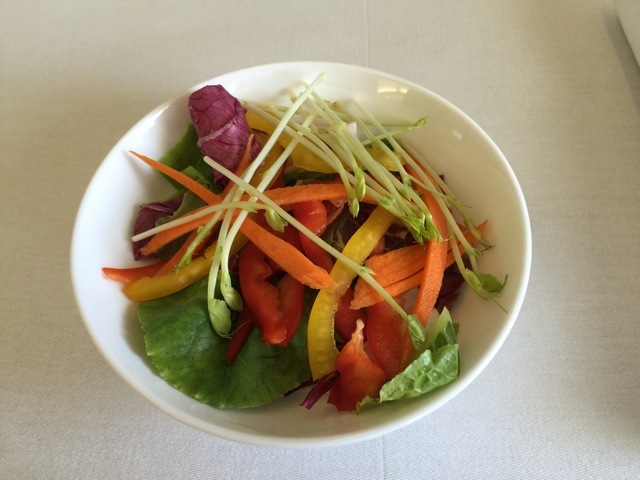 About thirty seconds after the salad arrives, the main course makes its first appearance. 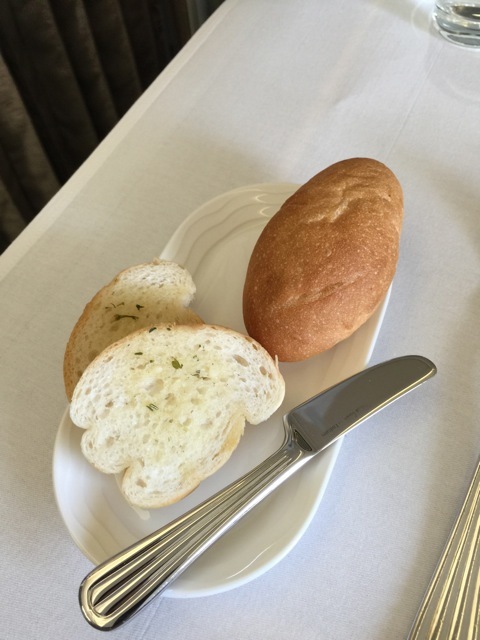 I ask the cabin crew if she would mind bringing it back in a few minutes, once I have finished the salad. Big mistake. 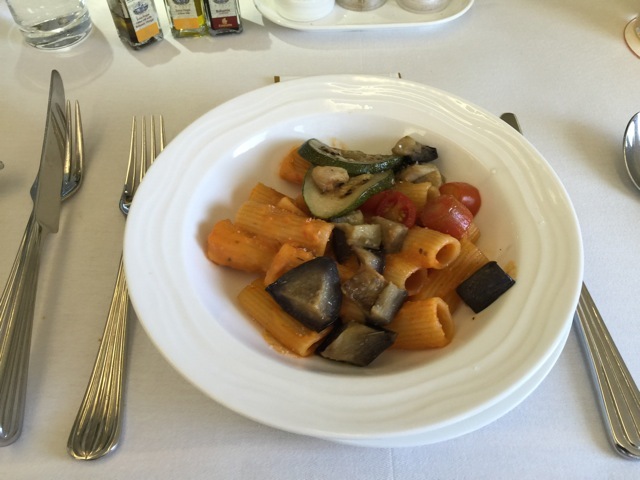 By the time I have finished the salad and the pasta arrives, it has already cooled down and is somewhat crispy… At least the portion is minute so I will not have to have a guilty conscience for not finishing all of it. 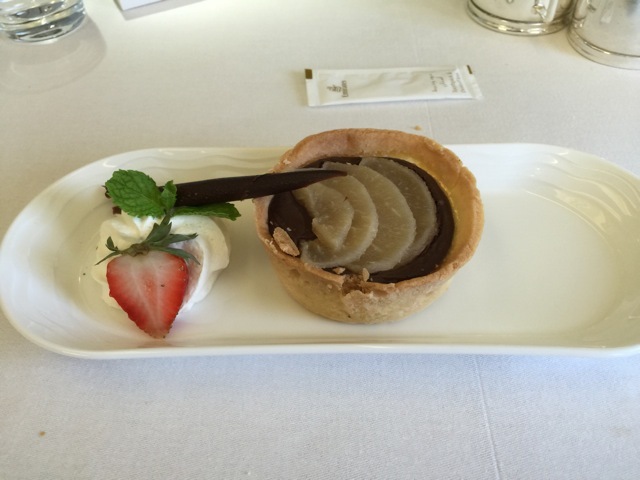 For dessert I try the chocolate pear tart, which, for some unearthly reason, is salty and not sweet and generally not very tasty. 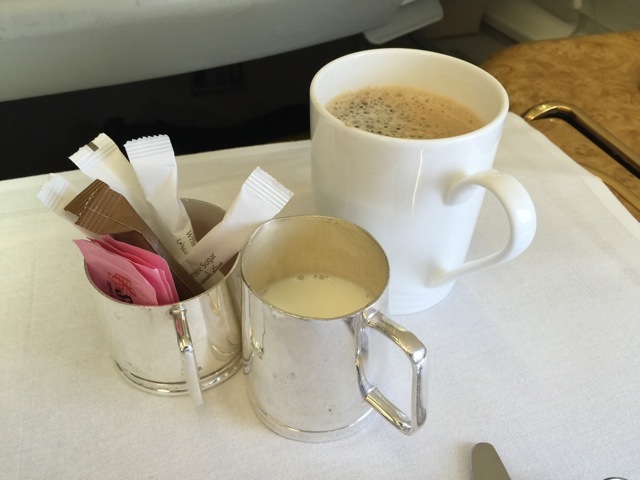 And finally, to finish, a cup of instant coffee. 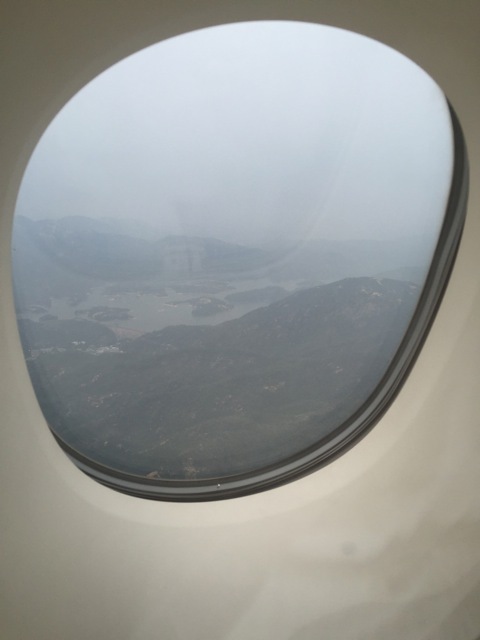 Shortly after the table is cleared again, it is already time for us to start our descent into Hong Kong. 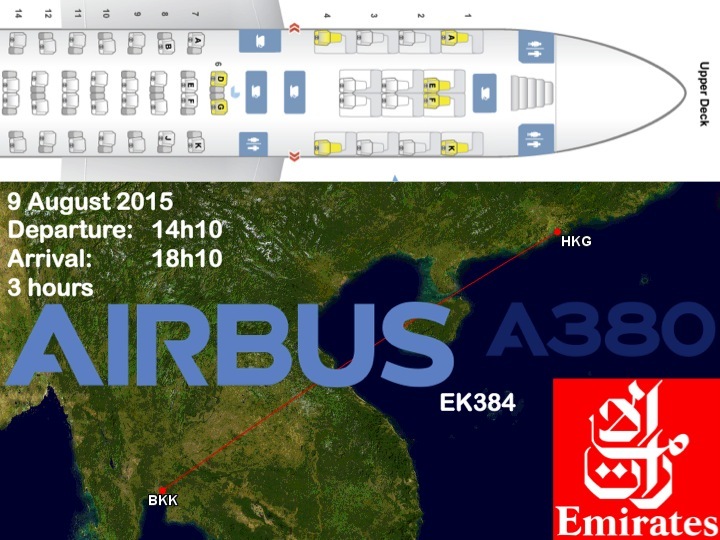 When we land, British Airways, Air France and Emirates are already there with their own A380. 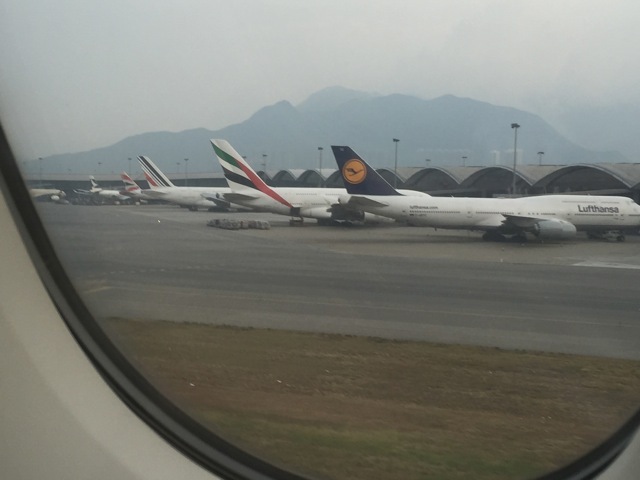 The odd one out is Lufthansa, who operate to Hong Kong with the B747-8. 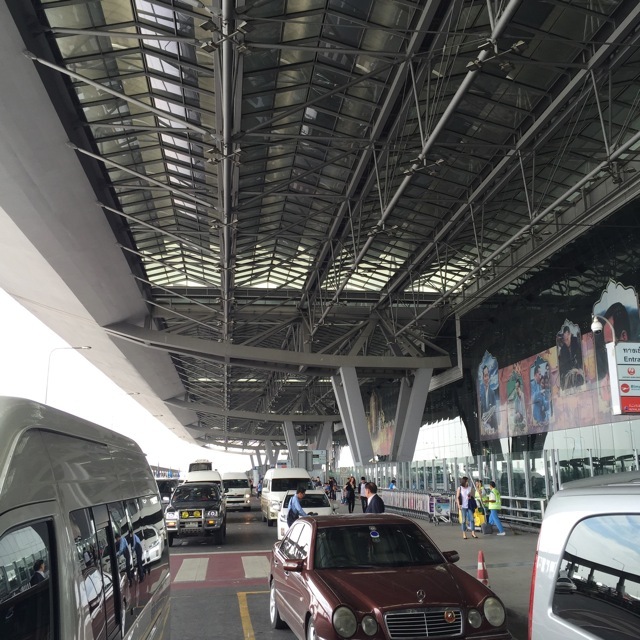 Transport: Airport express and metro. Departs from: Terminals 1 and 2, arrivals level. Journey time: roughly 40 minutes. Fare: HKD19.- for the airport express to Tsing Yi for two persons, and HKD18 for the metro from Tsing Yi to Mong Kok for two persons. I am staying at the Langham Place Hotel in Mong Kok this time round. 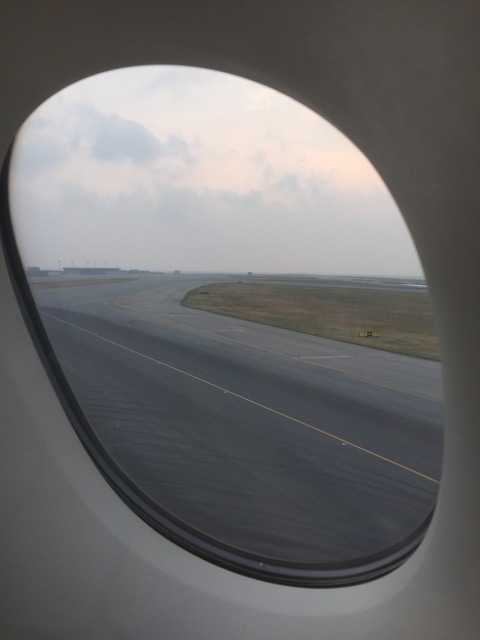 The easiest way to get there from the airport is to take the airport express and alight at the first stop, which is Tsing Yi. The journey from the airport to Tsing Yi takes about 15 minutes. From Tsing Yi you have to take the orange line one stop in the direction of Central. Then from there, all you need to do is cross the platform and catch a red line train also heading to Central. Mong Kok is the sixth stop. Do not worry, I still have quite a way to go. 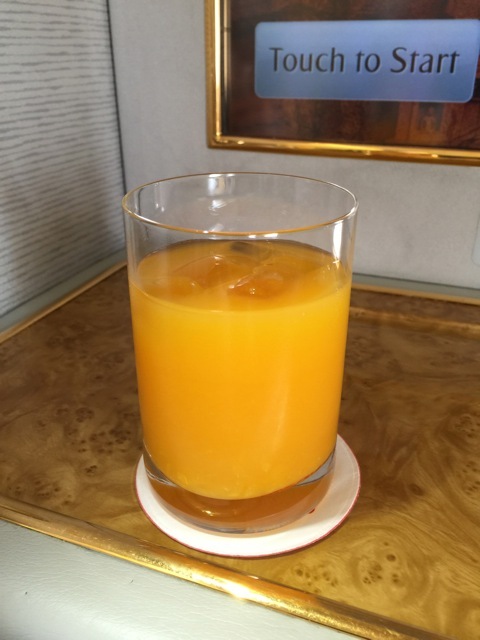 Even so, following this somewhat sobering experience on Emirates First Class, I think now is a good time to share some thoughts. First of all, personally I think Emirates really cannot keep up with Qatar Airways, both in terms of hardware and the overall experience. 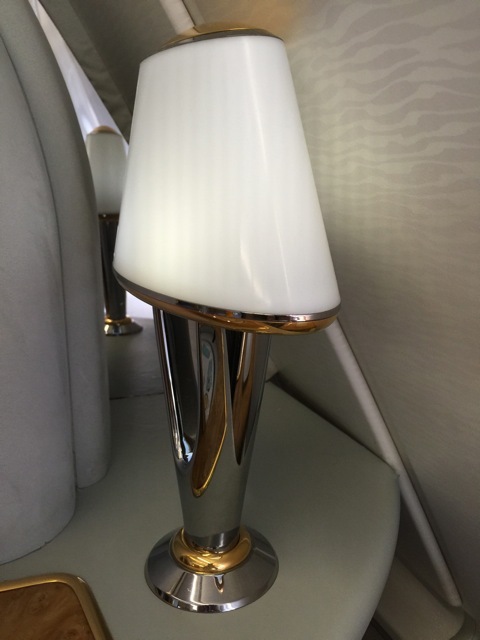 The Qatar Airways First Class cabin is very classy and understated. 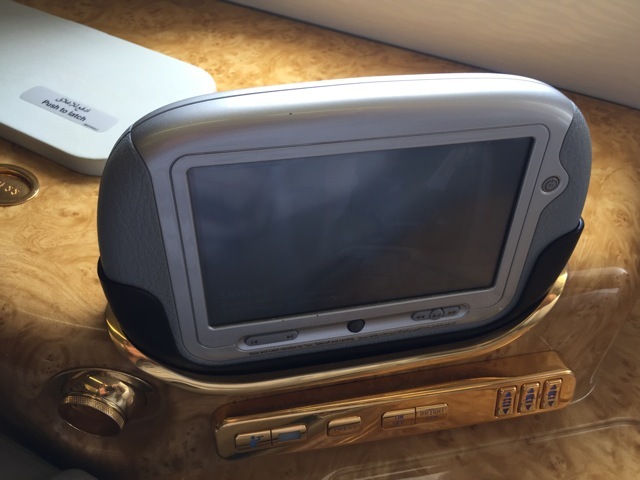 In contrast, the hardware on Emirates is in really quite bad taste. Honestly, who designed this kitsch? 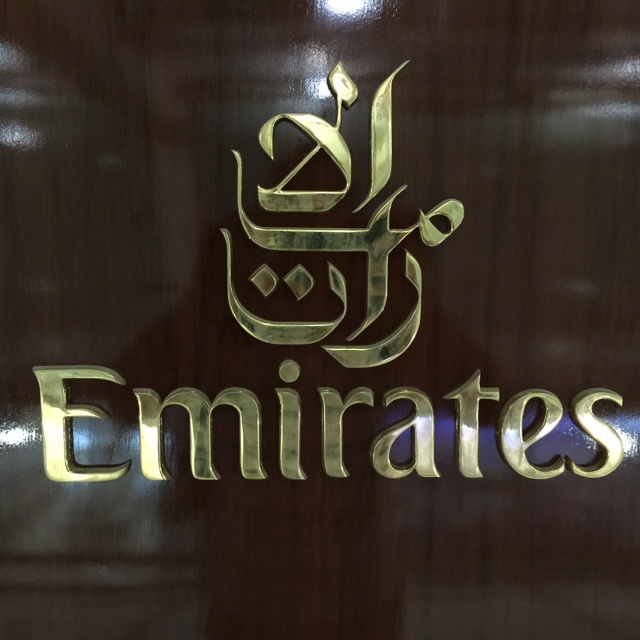 As far as usability is concerned, the Emirates suite also has some serious shortcomings. 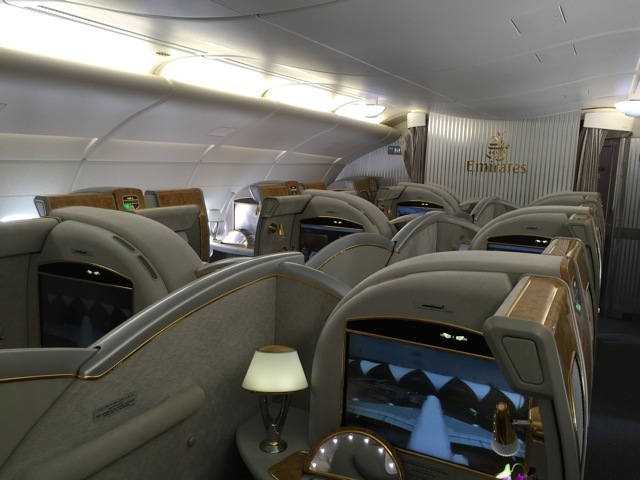 I also think that the Emirates First Class cabin and suite are starting to look a bit old fashioned and rather drab. 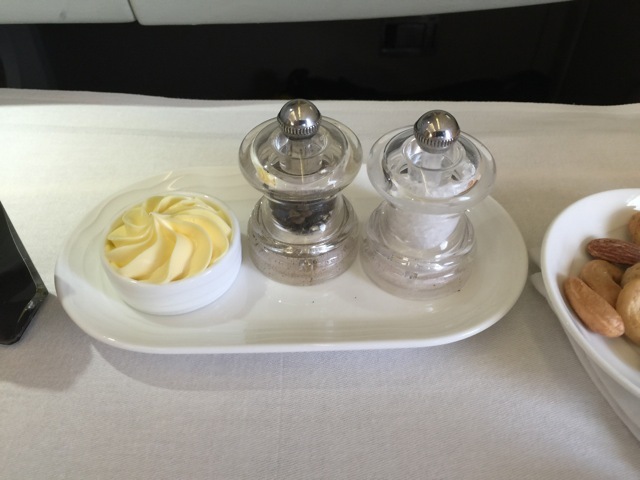 Furthermore, the crew on Qatar Airways are very friendly and pay a lot of attention to detail. It is little things. 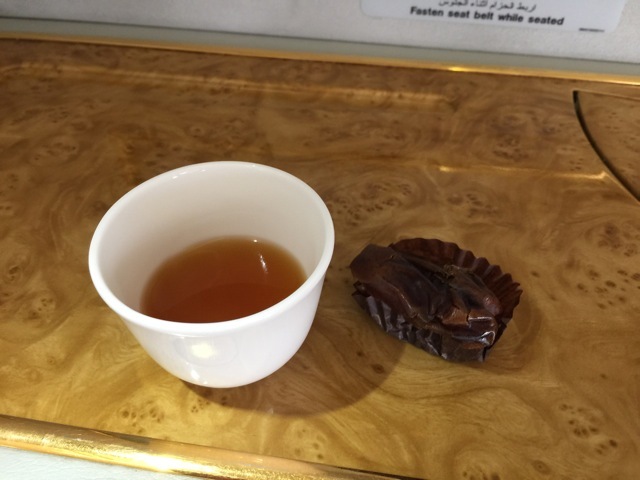 Whereas Qatar Airways will hand you the hot towel on a dish, on Emirates the flight attendant just places it in your hand, which is somewhat inconvenient if the towel is still hot. 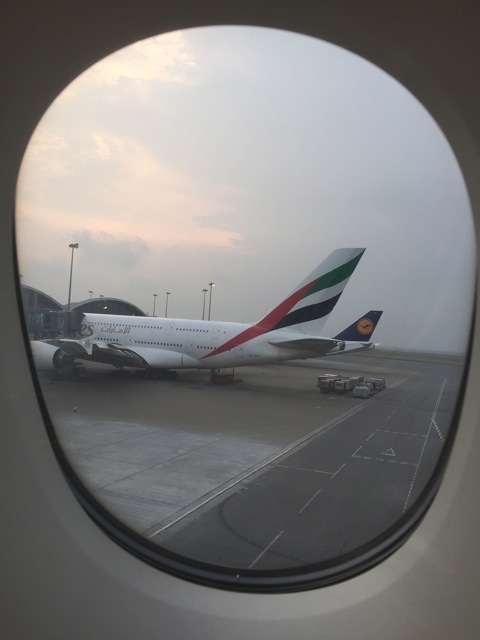 And secondly, I think it is quite apparent that Lufthansa’s Mr Spohr and his colleagues with all the American carriers have found an excellent scapegoat to hide their own shortcomings and failures in Emirates. 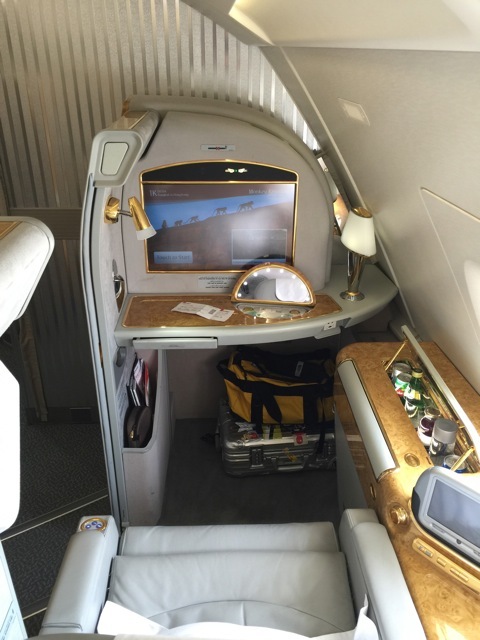 Repeatedly, Emirates has been made responsible for the ailing carrier’s appalling financial performance. 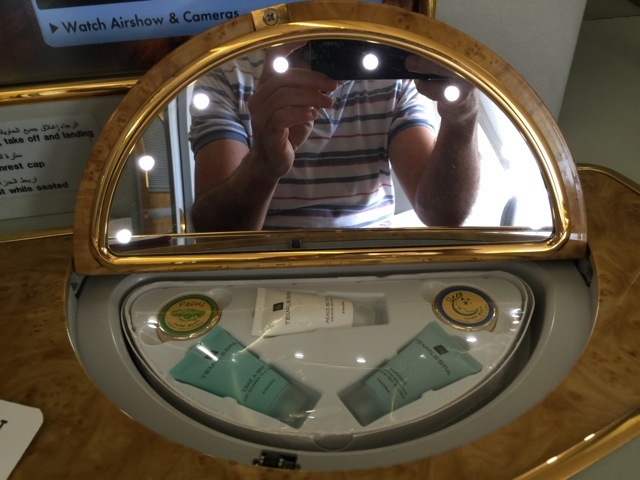 But quite frankly, if Mr Spohr seriously thinks the premium product of an airline like Emirates is competition, then I can only deduce from this that he has obviously never tried them. But apart from all that, I really do think that the Middle East carriers – and that includes Qatar Airways – will always be at a serious disadvantage because no matter how short the transfer time at their hub in Doha, Dubai or Abu Dhabi is and not matter how fancy their premium product on the ground is, they will not be able to make up for the loss of time and inconvenience of not taking a nonstop flight. 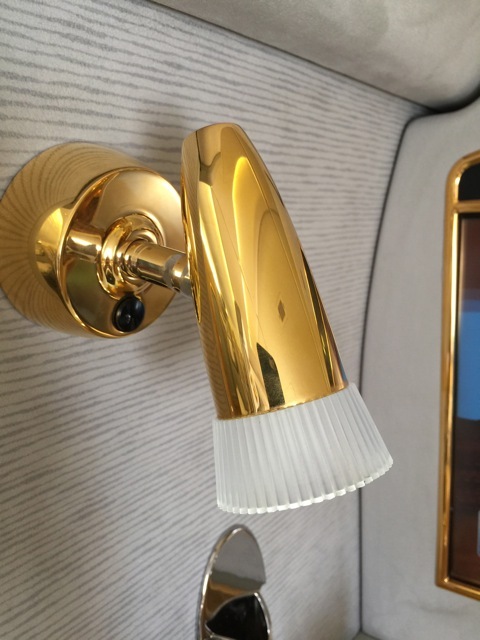 And finally, as far as Emirates is concerned, there was a time when they set the industry standard. I very much feel that this is no longer the case. And with such a crap product, quite frankly I am not surprised either. 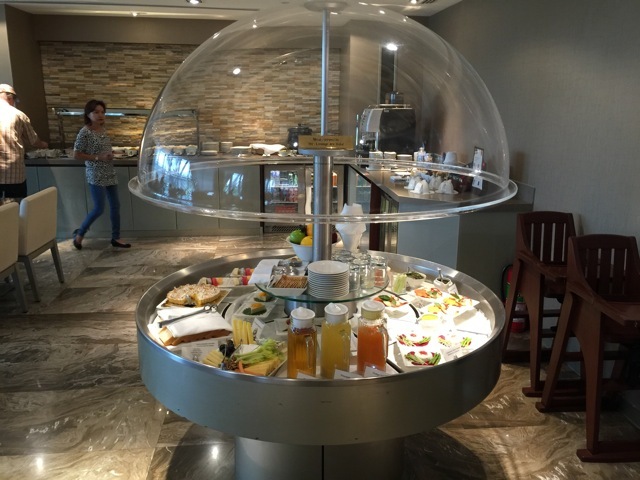 This entry was posted in Airbus A 380, Emirates, First Class and tagged airlines, aviation, departure gates, Emirates First Class, Emirates trip report, First Class, flying, Hong Kong, leisure traffic, review, transportation, travel, trip report, vacation. Bookmark the permalink. Hello William, thank you for your very enjoyable blog!